“Crispy Buttery Seasoned Crust” on the cover of a Hot Pockets© box gave me the idea that hot pockets aren’t made from a pizza kind of dough, after all. I really enjoy Hot Pockets, there’s just something about these frozen goodies that not only taste so yummy but satisfy a hungry appetite. 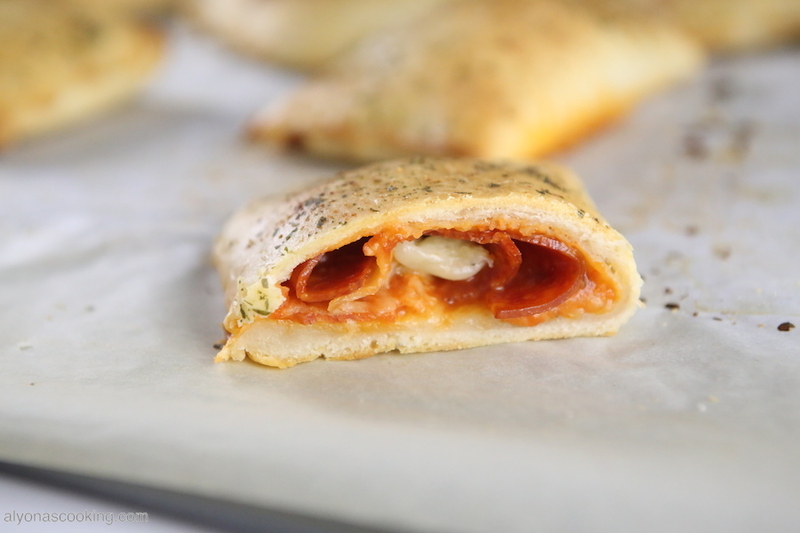 After attempting to make these from a pizza dough and coming out with something more of a calzone, I came to the thought that perhaps Hot Pockets are made from a pie crust kind of dough? After all, Hot Pocket dough does seem to be more on the thinner side and if they claim “buttery Seasoned Crust” then crust it may be. 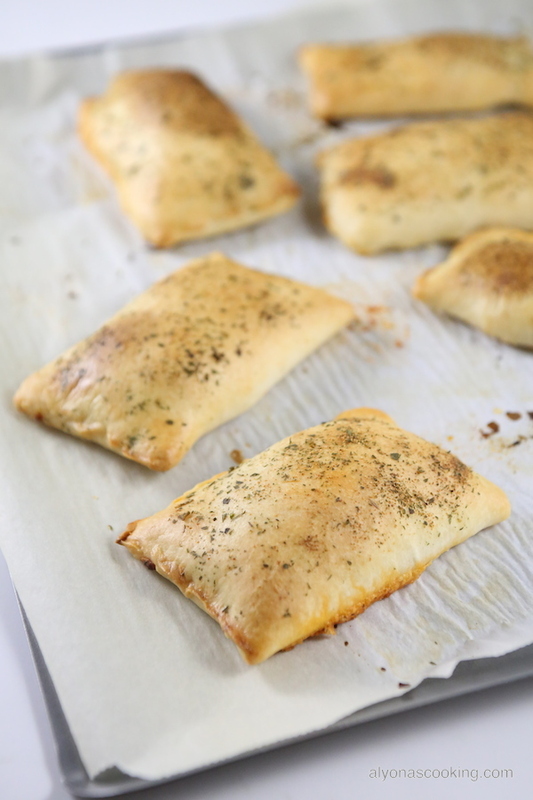 So butter and flour it is, to create these delicious stuffed pockets. 1. 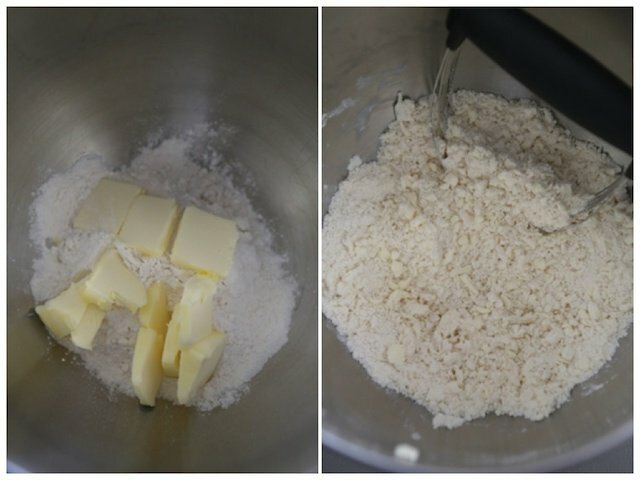 In the bowl of a stand mixer cut the butter into the flour. 3. 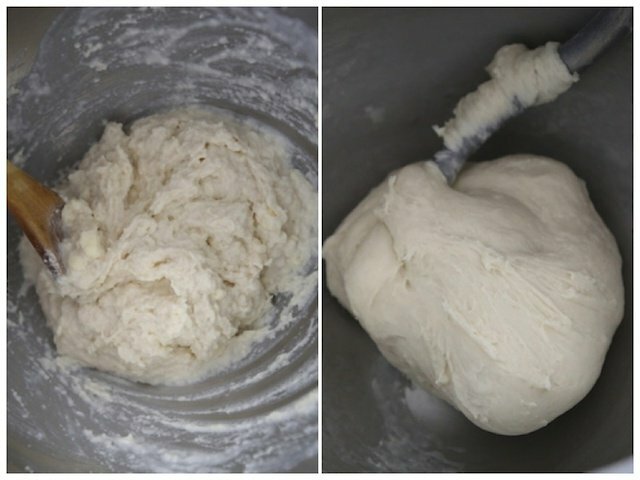 Cover and refrigerate dough for 1 hour. 4. 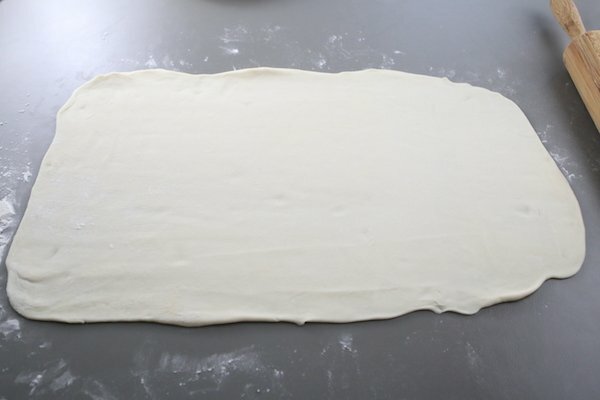 On a lightly floured surface, roll dough out into a 20 by 12-inch rectangle. 5. 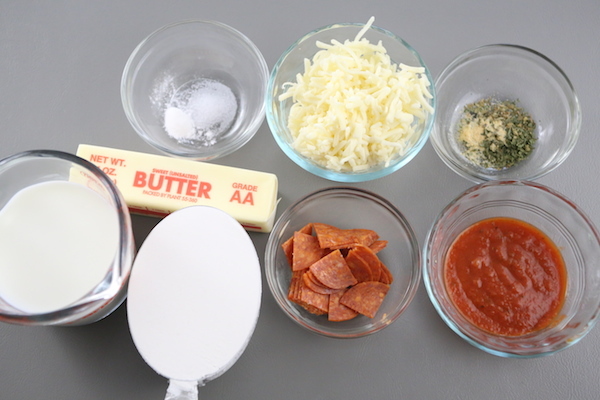 Cut dough out into 8 squares with each measuring about 5 by 6-inches. 6. 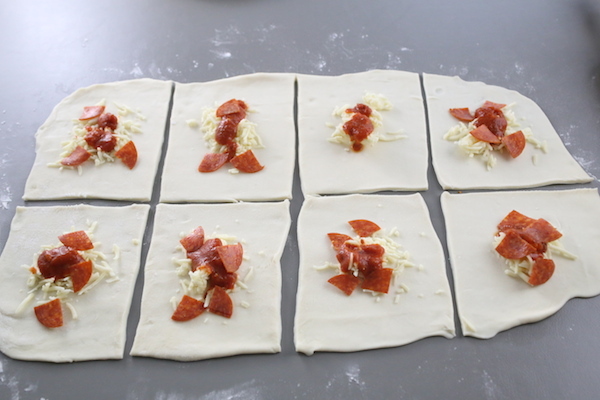 Fill each square with desired filling and pinch down the edges to seal the dough. 7. 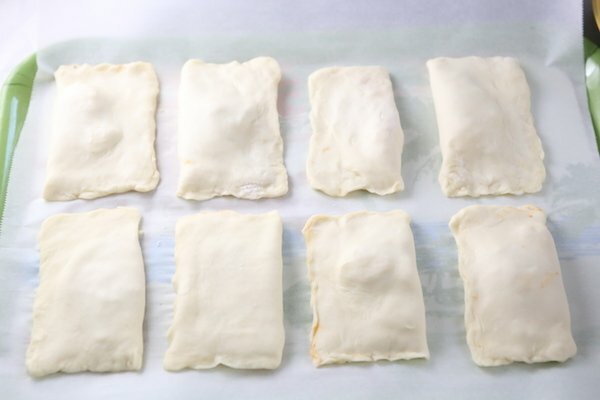 Place pockets onto parchment paper and refrigerate for 30 minutes. 9. Bake in a pre-heated 400F oven for 15 minutes. In the bowl of a stand mixer cut the butter into the flour, salt and baking powder. 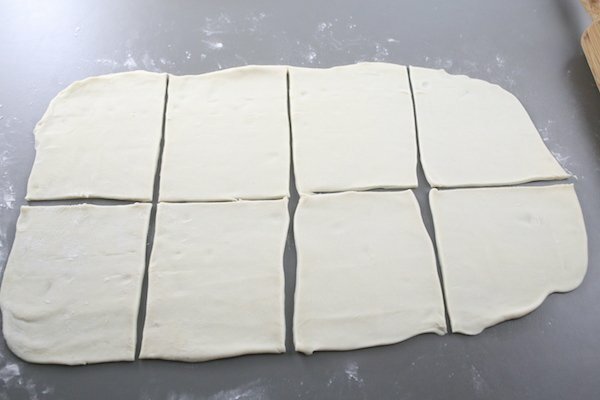 On a lightly floured surface, roll dough out into a 20 by 12-inch rectangle. 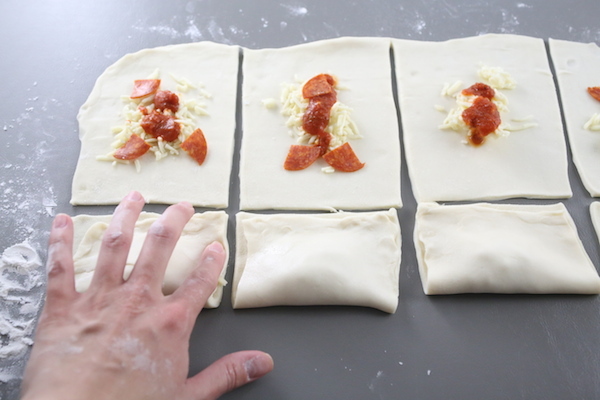 Cut dough out into 8 squares with each measuring about 5 by 6-inches. 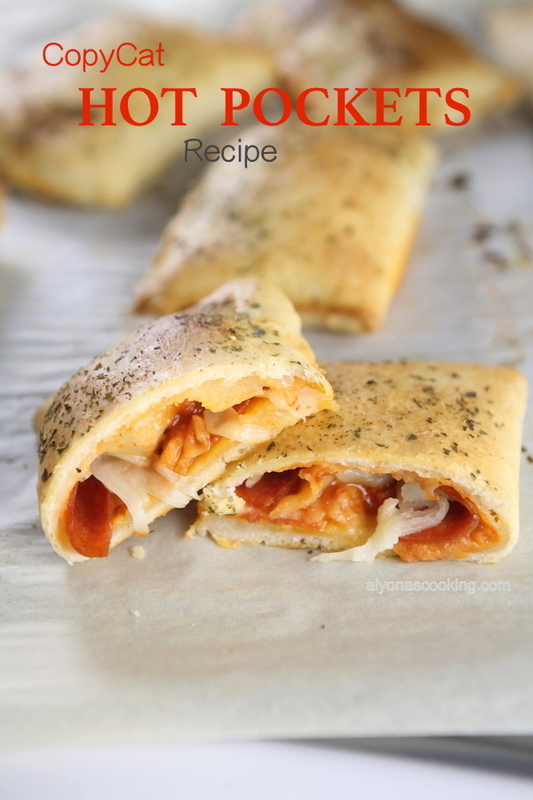 Fill each square with desired filling and pinch down the edges to seal the dough. Place pockets onto parchment paper and refrigerate for 30 minutes. Brush pockets with milk and sprinkle with dry herbs (oregano, garlic powder and parsley.) Bake in a pre-heated 400F oven for 15 minutes. Gonna try these. I am assuming the baking powder is mixed with the flour in step one? Yes, you’d want to do that before adding the wet ingredients, my apology for not including that to the instructions. As far as I can see, you are the only one on the internet that got the crust correct. 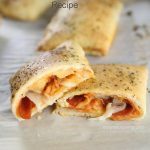 Other people are calling their recipes “copycat hot pockets” but they use puff pastry, pizza dough, pie crust, even tortillas – all of them tasty, but none of them anything like an actual Hot Pocket with its biscuity crust. 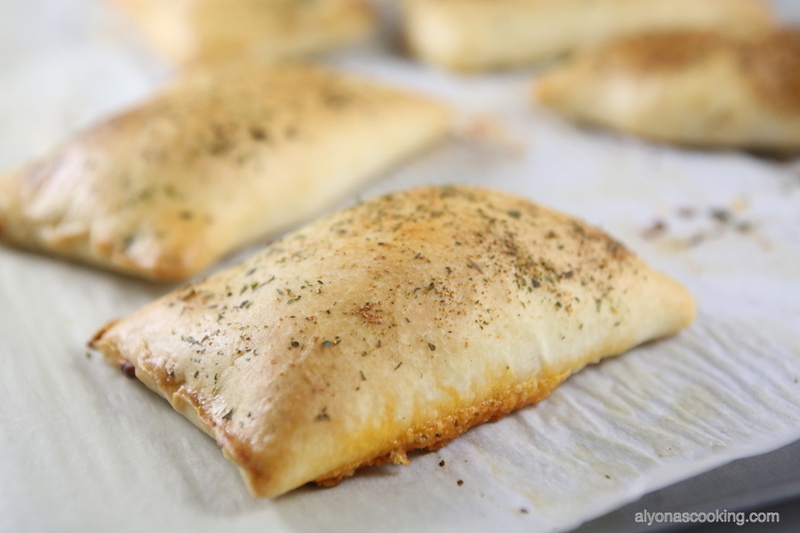 My teenage son likes these so well, maybe he’ll stop pestering me to buy Hot Pockets at the store – they are among the worst junk food out there. I’m flattered, Jen! If your willing to convert to homemade ones perhaps making a huge batch and partially baking them then freezing can save you time from making a fresh batch each time. Thank you for taking the time to leave such a nice feedback! Hey There! These look amazing! I look forward to making them. I would like to know if I can freeze these before cooking or should they be froze after the cooking ? Hi, Thank you, try partially cooking them and cooling prior to freezing that way they can be heated through like the frozen ones. I made them twice already and forgot to report back, I am so sorry. 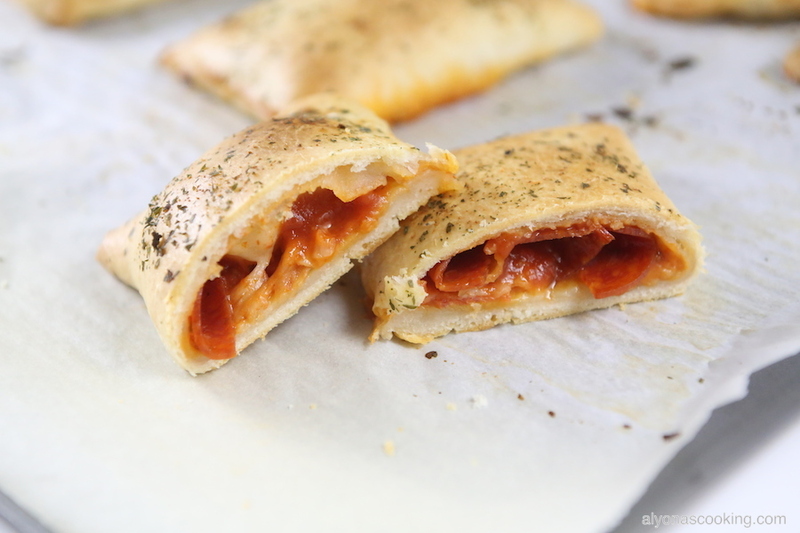 These pockets are super easy to make and are very, very delicious! This recipe made enough to eat right away and freeze a few. My picky eater approved and now makes request to put it in her lunch regularly. One day, when I was making these, one of my friend, who is also a mom, was visiting me. When she tried, I showed her your website and she’s now making for their kids. So, thank you from both of us for your great recipe! Very good recipe ingredients; however, instruction isn’t making sense. Cut butter into flour. Then, Mix with mixer add flour????? Alyona can you clearify. I will wait for your answer before I make it. Thank you so much for tackling hard project. My daughter loves these for lunch, but like you, I don’t want her to eat those chemicals. So, I will be making these for sure! Hi Tanyai, yes cut the butter into the flour using a pastry blender, as shown in step 1. Then stir in the milk into the butter/flour mixture, once the dough comes together, attach to a stand mixer and knead ADDING more flour if needed so the dough doesn’t stick to the sides of the bowl. I will clarify that in the instructions, thank you.